The reliability of Arizona Coyotes’ defenseman Michael Stone cannot be overlooked nor underestimated. Now, his value will be accentuated, and that’s because the native of Winnipeg will watch the Coyotes’ remaining games from the press box. Stone went down with a nasty knee injury last Saturday in a game against Philadelphia at the Gila River Arena. That’s when he became tangled with Flyers’ forward Michael Raffl in the corner near the end of the game. Helped off the ice by teammates and the medical staff, Stone was declared out of the following contest this past Monday night against the Flames at home. Then, the diagnosis came that the rugged blue-liner will not return for the final games of the season. Paired in recent contests with Kevin Connauton, the duo provided a very capable defense in front of net-minders Louis Domingue and Mike Smith. At the same time, Stone’s hard shot from the right point sent goalies dancing in the crease and teammates looking for rebounds in front. The combination rose Stone’s offensive capabilities, and he responded with his best point production. After he scored the eventual game-winner against the Flyers as the buzzer sounded to end the second period, he finished the season with six goals and career-high 36 points. Yet, his value transcends development from the offensive side. 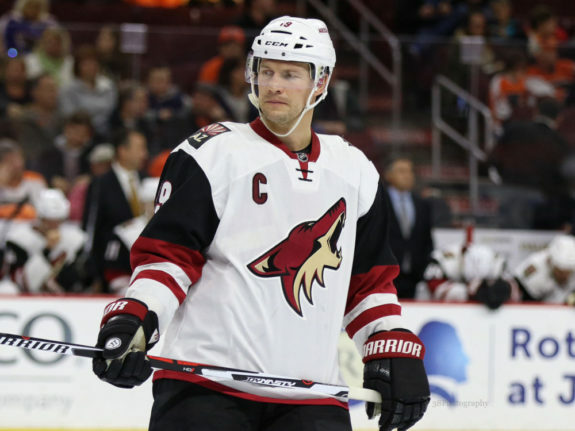 Because the Coyotes’ path to the Stanley Cup playoffs was obstructed several games ago, the players, to the credit of captain Shane Doan, have not laid down. They momentarily derailed the Flyers’ playoff chances with that win last Saturday, and continue to show Tippett, and other decision-makers, that their will, resolve and character remain strong. Save Stone, the Coyotes also lost Doan to injury in the Flyers’ game. Doan was hit hard in the back by Flyers’ defenseman Radko Gudas, also late in the game. Though Doan missed the next game, he was back in the line-up Thursday for a game at Dallas. The loss of both Doan and Stone seem to take a great deal from the Coyotes’ effort in the game following the Flyers win. In losing to the Calgary Flames at home 5-2 last Monday night, the team clearly felt the effects of losing one of their top defenseman and their captain. For now, Stone’s absence should put defensemen like Klas Dahlbeck and Alex Grant, recently recalled from AHL Springfield, under the microscope. Their education and development, over the final week, will clearly be monitored. While teams are always looking to build depth, Stone’s injury and subsequent absence from the line-up magnified the Coyotes’ essential requirement in this summer’s draft. That would be the need for a rugged, stay-at-the-blue line defenseman who will complement Stone’s developing offensive skills, and leverage the offensive force of Oliver Ekman-Larsson.